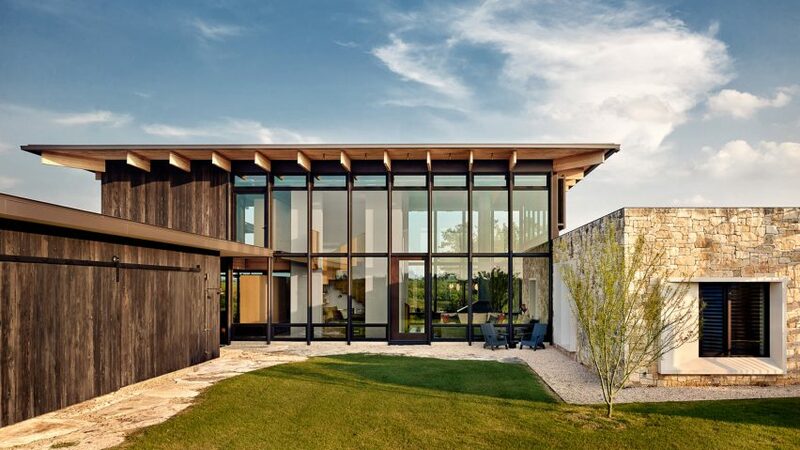 American studio Michael Hsu Office of Architecture has used charred wood, local stone and large stretches of glass to form this country home for an Austin family. 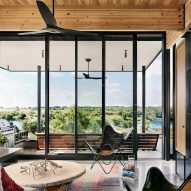 The Llano Retreat is situated along the Llano River in central Texas, about 75 miles (121 kilometres) northwest of the city. For years, the property had served as a primitive campsite for fly-fishing outings and weekend getaways. The family camped under a pole-structure with a metal roof. 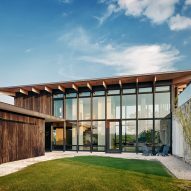 When the clients ultimately decided to build a more permanent retreat, they charged Austin-based Michael Hsu Office of Architecture with creating a building that embraced the natural terrain. "After years of getting to know the ranch land, the family chose a site for their home at the top of a hill overlooking the river, only accessible through a low-water crossing," said the team. "The design is a result of the knowledge of the landscape and the desire to retain the connection to nature." Roughly U-shaped in plan, the two-storey dwelling consists of rectilinear volumes organised around a front courtyard. In the rear, the home overlooks a gentle slope dotted with trees, shrubs and wildflowers. Exterior walls are clad in materials that complement the landscape. 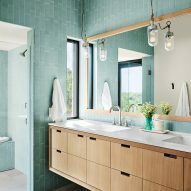 Locally sourced limestone is paired with wood that was charred using the ancient Japanese technique of shou sugi ban. Together, the materials form "a rustic yet refined palette that transitions from inside to out". The team also incorporated large expanses of glass, which help diminish the boundary between inside and out. Deep roof overhangs shade glazed walls during the summer and allow sunlight to penetrate in the winter, providing passive heating. 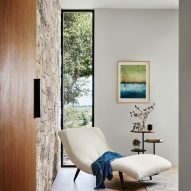 Doors and operable windows enable southern breezes to flow through the house during warm months. The home has a fluid layout, yet zones are clearly delineated. The central volume contains public areas at ground level, and a media room and bunk room upstairs. A garage and a series of bedrooms are situated in the side wings. The living room features a double-height ceiling and tall windows, which offer generous views of the natural terrain and vast blue sky. Sliding glass doors in the kitchen enable the family’s activities to spill outdoors. The designers used a mix of interior materials to create a rustic yet cosy atmosphere. Ceilings are wrapped in warm-toned Douglas fir and are traversed by exposed beams. 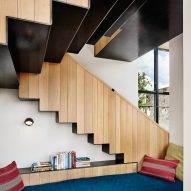 Steel was used to fabricate the central fireplace and staircase, and floors are made of either concrete or wood. Eclectic decor adds colour and texture to the space. "In the dining room, a custom live-edge walnut table combines with chairs upholstered with vintage military tents dyed into a weathered indigo," the team said. "Soft grey upholstery, handwoven rugs and rich leathers complement the interiors for a welcoming and relaxed atmosphere overlooking the rustic Hill Country landscape." Michael Hsu Office of Architecture was founded in 2005. 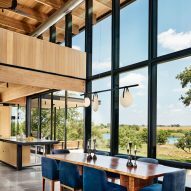 Other projects by the studio include ATX Cocina, an Austin restaurant that features a curved wooden ceiling, an open kitchen and floor-to-ceiling windows. Photography is by Casey Dunn.